Who's your favourite bounty hunter? Please pick only one, no ties, honourable mentions, contrivances, etc. Despite his brief appearances (in both canonical and non-canonical works), I quite like the look and mystique of Dengar. Definitely a character I'd like to have seen more of. There was a certain quiet intensity about him. EDIT: And if Fett happens to be your favourite, well pick another one, please! Sticking to the movies, how many bounty hunters are there? There's Boba Fett, obviously, and Greedo and the handful you see gathered in ESB, who do very little. And in the prequels we have Jango Fett and a couple of others whose names I can't remember. Oh, and theres' Boushh, who's actually Leia in disguise. Guess that's my favourite then. 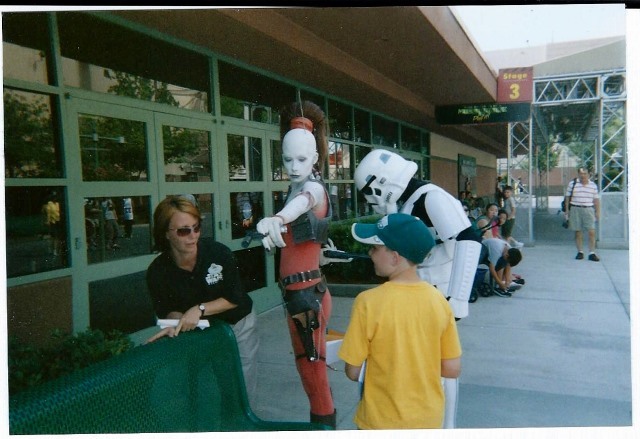 This photo was taken during Star Wars weekend at Disneyworld 2005. My son got to meet her, she stayed in character thru out .Begrudgingly giving him an autograph. She's been my favorite since. BTW she slays that Stormtrooper during a short street skit. Barring Boba Fett, mine would have to be Valance, from the late 70s Marvel STAR WARS comic adaptation. Ex-Imperial Stormtrooper, turned cyborg bounty hunter with an intense hatred of droids. Ends up sacrificing himself to stop Darth Vader from learning Luke Skywalker's identity. Wasn't familiar with him, Bill (Google helped), he sounds a most intriguing character. Bossk. Such an awesome lizard-person. And the action figure came with a great gun. It was a shame he was such an incoherent chump in the DARK FORCES video games, but his gun was again awesome. Zam Wesell from "Attack of the Clones." 4-LOM, baby. Love me a scary C-3PO. In retrospect, Zam may have been more of a hitman than a bounty hunter. Anyone know more about her/him? I only know Zam from AOTC. Bill Mimbu: Barring Boba Fett, mine would have to be Valance, from the late 70s Marvel STAR WARS comic adaptation. Same for me. Those Valance issues were terrific. I can recommend TALES OF THE BOUNTY HUNTERS, available as a book and eBook via Amazon. Always had an affinity towards Dengar having got hold of the figure in some kind of offer where you had to send the names from the packs off. Zuckuss was the mail-away figure, not Dengar. I sent off for him, too. Still have it. Not in the UK - Boba Fett was the first figure I mailed away for and then a year or so later they did the same thing with Dengar. Boba Fett was the first mail-away figure in the US. It was advertised as including an awesome spring-loaded missile, but some idiot kid choked on a similar part on a Battlestar Galactica toy leading to ruined fun for everybody. I wasn’t talking about the after mail away. I knew he was first. Didn’t realize the UK had a different mail away figure than the US. My mistake. Not a problem. I just remember getting him and not having a clue who he was. I remember the offer for Zuckess and thinking that he was the only one not to have a figure yet. He had more personality than any of 'em! IG-88 - something about the idea of a droid hunting living beings for monetary rewards just seems weird and cool.